gluten free diet | Hectic life. Healthy girl. 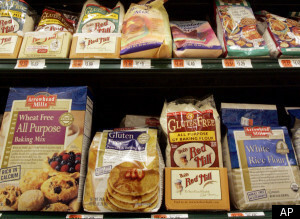 Is A Gluten-Free Diet Really Healthier? Have you noticed the abundance of gluten-free foods available at grocery stores or on menus these days? The proliferation of gluten-free products, along with the marketing of them, might lead you to believe that they are the new panacea to better health or weight loss. So, what’s the real story? Will going on a gluten-free diet improve your health or help you lose weight? The answer is that it depends. Limiting your intake of gluten means you are cutting out many starchy, refined carbohydrates, and that in itself can help your weight and health. Eating gluten-free, however, is a must for those with celiac disease, who face real risks from ingesting gluten. Gluten is a protein found in wheat, barley and rye products. Most cereals and breads contain gluten. Examples of gluten-free grains include brown or wild rice, quinoa, millet, buckwheat and amaranth. What is not widely known about gluten-free products is that they still contain the same number of carbohydrates as their gluten-containing counterparts. In this regard, there is no health benefit to choosing the gluten-free versions. For example, a typical slice of gluten-free bread contains 15 grams of total carbohydrate — the same amount as a regular slice of bread. A snack of gluten-free crackers can contain 30 grams of carbohydrate per serving, the same as regular crackers. So why avoid gluten in the first place? For those with celiac disease, their health demands it. Celiac disease is an autoimmune disease resulting in a true intolerance to gluten. If someone with celiac disease consumes gluten, it causes the villi, or little hair-like projections that move food through the gut, to atrophy. This atrophy can cause bleeding, malabsorption of nutrients and other health complications. According to the National Institutes of Health, more than two million (or one in 133) people have celiac disease. However, only about 1 percent of the population has actually been diagnosed. To get an accurate diagnosis, you need a blood test and/or small bowel biopsy to determine if there is atrophy in your gut. Research shows that another 39 percent of the population may be susceptible to having celiac or gluten intolerance/sensitivity. Some experts believe gluten sensitivity exists, but no research or tests to date are available for diagnosis. Symptoms of gluten sensitivity are diffuse, and can include headaches, fatigue or irritable bowel syndrome (IBS). In addition, there is a small amount of research showing that gluten is associated with some forms of inflammation in the body for those with auto-immune diseases such as diabetes or Multiple Sclerosis (MS). Many who go on a gluten-free diet may lose weight and feel better, but it has nothing to do with avoiding gluten. Just cutting out starchy, processed forms of carbohydrate or limiting carbohydrate intake helps with lowering insulin resistance, which leads to weight loss and improved energy. If you have celiac disease, eating gluten-free is your only option. If you believe you have gluten sensitivity, going on a gluten-free diet is worth exploring. For the rest of us, there’s no need to follow the trends of what is currently in vogue with food manufacturers. Eating simple, unprocessed foods according to what your body can tolerate is the best way of eating. Something you’re eating may be killing you, and you probably don’t even know it! If you eat cheeseburgers or French fries all the time or drink six sodas a day, you likely know you are shortening your life. But eating a nice dark, crunchy slice of whole wheat bread–how could that be bad for you? Well, bread contains gluten, a protein found in wheat, barley, rye, spelt, kamut, and oats. It is hidden in pizza, pasta, bread, wraps, rolls, and most processed foods. Clearly, gluten is a staple of the American diet. What most people don’t know is that gluten can cause serious health complications for many. You may be at risk even if you don’t have full blown celiac disease. In today’s blog I want to reveal the truth about gluten, explain the dangers, and provide you with a simple system that will help you determine whether or not gluten is a problem for you. This study looked at almost 30,00 patients from 1969 to 2008 and examined deaths in three groups: Those with full-blown celiac disease, those with inflammation of their intestine but not full-blown celiac disease, and those with latent celiac disease or gluten sensitivity (elevated gluten antibodies but negative intestinal biopsy). The findings were dramatic. There was a 39 percent increased risk of death in those with celiac disease, 72 percent increased risk in those with gut inflammation related to gluten, and 35 percent increased risk in those with gluten sensitivity but no celiac disease. This is ground-breaking research that proves you don’t have to have full-blown celiac disease with a positive intestinal biopsy (which is what conventional thinking tells us) to have serious health problems and complications–even death–from eating gluten. Yet an estimated 99 percent of people who have a problem with eating gluten don’t even know it. They ascribe their ill health or symptoms to something else–not gluten sensitivity, which is 100 percent curable. Another study comparing the blood of 10,000 people from 50 years ago to 10,000 people today found that the incidences of full-blown celiac disease increased by 400 percent (elevated TTG antibodies) during that time period. (ii) If we saw a 400 percent increase in heart disease or cancer, this would be headline news. But we hear almost nothing about this. I will explain why I think that increase has occurred in a moment. First, let’s explore the economic cost of this hidden epidemic. Undiagnosed gluten problems cost the American healthcare system oodles of money. Dr. Peter Green, Professor of Clinical Medicine for the College of Physicians and Surgeons at Columbia University studied all 10 million subscribers to CIGNA and found those who were correctly diagnosed with celiac disease used fewer medical services and reduced their healthcare costs by more than 30 perecnt. (iii) The problem is that only one percent of those with the problem were actually diagnosed. That means 99 percent are walking around suffering without knowing it, costing the healthcare system millions of dollars. And it’s not just a few who suffer, but millions. Far more people have gluten sensitivity than you think–especially those who are chronically ill. The most serious form of allergy to gluten, celiac disease, affects one in 100 people, or three million Americans, most of who don’t know they have it. But milder forms of gluten sensitivity are even more common and may affect up to one-third of the American population. Why haven’t you heard much about this? Well, actually you have, but you just don’t realize it. Celiac disease and gluten sensitivity masquerade as dozens and dozens of other diseases with different names. We used to think that gluten problems or celiac disease were confined to children who had diarrhea, weight loss, and failure to thrive. Now we know you can be old, fat, and constipated and still have celiac disease or gluten sensitivity. Gluten sensitivity is actually an autoimmune disease that creates inflammation throughout the body, with wide-ranging effects across all organ systems including your brain, heart, joints, digestive tract, and more. It can be the single cause behind many different “diseases.” To correct these diseases, you need to treat the cause–which is often gluten sensitivity–not just the symptoms. Of course, that doesn’t mean that ALL cases of depression or autoimmune disease or any of these other problems are caused by gluten in everyone–but it is important to look for it if you have any chronic illness. By failing to identify gluten sensitivity and celiac disease, we create needless suffering and death for millions of Americans. Health problems caused by gluten sensitivity cannot be treated with better medication. They can only be resolved by eliminating 100 percent of the gluten from your diet. The question that remains is: Why are we so sensitive to this “staff of life,” the staple of our diet? They include our lack of genetic adaptation to grasses, and particularly gluten, in our diet. Wheat was introduced into Europe during the Middle Ages, and 30 percent of people of European descent carry the gene for celiac disease (HLA DQ2 or HLA DQ8), (xii) which increases susceptibility to health problems from eating gluten. American strains of wheat have a much higher gluten content (which is needed to make light, fluffy Wonder Bread and giant bagels) than those traditionally found in Europe. This super-gluten was recently introduced into our agricultural food supply and now has “infected” nearly all wheat strains in America. To find out if you are one of the millions of people suffering from an unidentified gluten sensitivity, just follow this simple procedure. For this test to work you MUST eliminate 100 percent of the gluten from your diet–no exceptions, no hidden gluten, and not a single crumb of bread. Then eat it again and see what happens. If you feel bad at all, you need to stay off gluten permanently. This will teach you better than any test about the impact gluten has on your body. But if you are still interested in testing, here are some things to keep in mind. • HLA DQ2 and DQ8 genotyping for celiac disease (used occasionally to detect genetic suspectibility). When you get these tests, there are a few things to keep in mind. In light of the new research on the dangers of gluten sensitivity without full blown celiac disease, I consider any elevation of antibodies significant and worthy of a trial of gluten elimination. Many doctors consider elevated anti-gliadin antibodies in the absence of a positive intestinal biopsy showing damage to be “false positives.” That means the test looks positive but really isn’t significant. We can no longer say that. Positive is positive and, as with all illness, there is a continuum of disease, from mild gluten sensitivity to full-blown celiac disease. If your antibodies are elevated, you should go off gluten and test to see if it is leading to your health problems. So now you see–that piece of bread may not be so wholesome after all! Follow the advice I’ve shared with you today to find out if gluten may be the hidden cause of your health problems. Simply eliminating this insidious substnace from your diet, may help you achieve lifelong vibrant health.